" Excellent job, super quick and immaculately tidy. Fabulous finish and not a drop of paint left anywhere it should not be. Arrived on time and was professional and pleasant to deal with. I was totally amazed. Highly recommended, and at a very competitive price. " " Brilliant work , very fast and ultra tidy. I very highly recommend Paul for any painting in any house. My son's thought he was so expert and fast , he asked ' Is Paul Bionic?!!' Fantastic job, thank you so much. I have already booked him for more work next month. " " Paul. I was looking for a painter in Lucan as i wanted the Full interior painted and Paul done it at a very competitive price. Paul worked with my builders to ensure the job was completed on time a very high standard. Very clean work with no mess. Impressive sanding" festool equipment "which left walls smooth with no dust. A pleasure to work with. Thanks Garvan "
" Paul is a very good painter, has extensive knowledge and gave sound advice when consulted regarding our decoration plans, He is very neat, always on time and leaves an excellent finish. Highly Recommended :) "
" Thank you Paul for doing such a great job. We're delighted with the paintwork. Very friendly, arrived on time and accommodated us on very short notice. Very clean, no mess what-so-ever and very high quality of work. Cannot recommend highly enough! " " Paul was terrific when we needed to have our two-bedroom apartment in Dublin painted so we could find tenants for it. He and his assistant worked at night and on weekends to finish the job quickly -- even before the day they had promised to finish. The quality of the work was very high, and the price was reasonable. " " Paul recently completed a paint and wallpapering job for us and did an excellent job. He is friendly, reliable and very professional. The work was carried out to a very high standard and he also offered great advice where needed. I would also echo the other comments in relation to him being very neat and tidy. The price charged was very reasonable. I would have no hesitation in using him in the future or recommending him to a friend. Thanks again Paul! " " I have no hesitation in recommending Paul. He does an excellent job and is very reasonably priced. Very professional and thorough workmanship. If you are looking for a painter /decorator, you will not go wrong with Paul. Give him a call. " " I HAVE USED PAUL'S SERVICES ON A NUMBER OF OCCASIONS AND HIS WORK HAS BEEN OUTSTANDING AS ALWAYS. HE IS VERY NEAT AND TIDY, TURNS UP ON THE AGREED DATE AND TIME. WORK IS COMPLETED ON TIME AND TO PERFECTION. I WOULD HAVE NO HESITATION IN RECOMMENDING PAUL. " " I was delighted with the job that Paul did for me. He is a very hard worker and the rooms he painted I am really happy with. The bathroom walls were peeling badly from condensation. Now the walls are smooth and neatly painted with no evidence of any previous problem. I would definitely recommend him and hope to use his services again. " " Paul is a super guy. Work is excellent and precise. Always on time and very efficient and tidy. As well as jobs for my own house I got Paul to do some jobs for my quite elderly Mother - I knew he'd look after her and the jobs really well....and he did of course. " 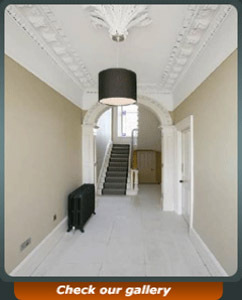 " Paul is incredibly professional painter and decorator. The work was done very neatly, very efficiently and I felt Paul's price was very reasonable. I hope to use byrybak.com again soon. " " We are extremely happy with the work that Paul has done over the last number of days. Paul has been punctual without fail and entirely reliable for the entire duration of the work, a real professional. He has obviously built up a good body of experience over the past number of years and was able to give sound advice on a number of queries we had with regards to finishes and different brands of paint. He's cheerful and receptive when you come to him with questions, and gives decisive answers. I'd also have to put in a word for how diligent they were in tidying up at the end of every working day! It really makes a difference, especially if you're getting a big job done. In short, very happy with Paul and the work he has done and would be happy to recommend him "
" I found byrybak.com painters to be very neat while they were working, Their attention to detail was excellent. They were very helpful in choosing paint types. They were very punctual when arriving on site for work or for meetings. All in all we would have no hesitation in recommending byrybak.com for decorating work of all sizes. " " Paul just did an excellent painting job! My wife and I are delighted with the results. Straight from the very beginning we found Paul very helpful - as we are a household with two dogs, Paul gave us suggestions as to what type of colors would suit heavy traffic areas etc. He is punctual without fail, neat, very organized, has great attention to detail and last but not the least a brilliant person! I would have no hesitation in recommending him for any painting job! " " Paul just finished a painting job in our new house. We are very pleased with the work, he did exactly what was agreed and was extremely tidy and neat. I would have no problem recommending Paul. He was also very helpful in recommending paints and tips on what we should do in areas where there will be heavy traffic, how to paint our wind boards and skirting. Its good to get information like this from a professional. Much appreciated Paul "